Buhler AG, KraussMaffei Group, Leistritz AG, Coperion GmbH, Thermofisher Scientific, and Toshiba Machine are among the leading companies operating in the global twin screw extruders market. According to a new study by Transparency Market Research (TMR), these companies primarily focus on achieving long-term growth through innovations and research and development activities. Strategies adopted by these companies to gain a stronger foothold have a profound impact on the overall market operations. According to TMR, the global twin screw extruders market will continue exhibiting a steady trajectory between 2017 and 2025. TMR has pegged the global twin screw extruders market at US$916.2 mn in 2017 and by the end of 2025, it is likely to reach US$1.15 Bn. If these figures hold true, the global twin screw extruders market will expand at a steady 2.9% CAGR from 2017 to 2025. On the basis of revenue generated, Europe held the leading share in the global market in 2017. However, Asia Pacific is likely to show the highest CAGR during the course of the aforementioned forecast period. Based on product type, the demand for co-rotating machines is higher volume-wise, finds TMR. The usability of twin screw extruders has greatly surpassed that of single screw extrusion in the last couple of years. Twin screw extruders offer several benefits such as greater flexibility, easy cleaning, and maintenance. It also helps in maintaining a consistent quality of products and monitoring faster shut down and startup between product changes. In the coming years, the market is expected to gain from the rising demand from the plastic, food, and rubber processing industries. Emerging applications in the pharmaceutical sector is also likely to boost the global twin screw extruders market. Given the recent technological advancements, growth is projected to remain steady for the global twin screw extruders market. Also, the market players will find lucrative opportunities in the plastic industry as many companies are undergoing the phase of replacing their earlier extruders. In addition, the rising production of plastic goods and the increasing applications across diverse sectors are projected to help the market grow in the coming years. Besides this, the market is also likely to benefit from the growing demand from packaging and food and beverages industries. In emerging economies the market will gain from the rising demand for pipes in irrigation and construction sectors. Given the rising disposable income of consumers, coupled with changing lifestyle preferences and aspirations, the demand for processed and packaged foods is likely to rise in the coming years. This in turn will fuel the demand for twin screw extruders from the plastic packaging industry in the coming years. According to the Federation of the Indian Chambers of Commerce and Industry, the Indian government is planning an investment of over US$3.9 bn to boost its railway, road, and shipping infrastructure over the coming years. Likewise, India’s plastic processing industry is likely to reach nearly 22 million metric tonne per annum by 2022. It is important to note here that plastics are crucial materials that go into making of products such as pipes, water proofing membranes, wires & cables, and wooden PVC composites. Besides this, the demand for plastic is expected to rise in China. 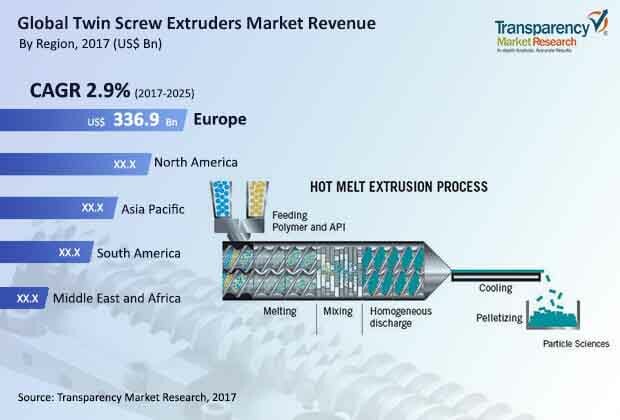 Spurred by these developments, the enterprises operating in the twin screw extruders market can expect higher demand in the coming years. The rising demand for sophisticated and quality products will also enable the global twin screw extruders market gain impetus in the near future.